Have you ever found yourself craving certain foods when you are feeling stressed? Well, you’re not alone. Stress eating, also known as emotional eating, is eating in response to how you are feeling rather than hunger. According to researchers, high-fat and high-calorie foods (sometimes called “comfort foods”) actually can make us feel better. The more comforting the comfort food, the better we feel. A habit of stress eating can lead to weight gain and serious health concerns over time. That’s why we should try to understand how stress eating works and how to break the cycle. Stress is the body’s response to a perceived threat or demand. And it’s not surprising that stress can have an impact on your appetite. Short-term stress can cause an increase in adrenaline, which can lead to suppressing of your appetite. Long-term stress causes increased levels of cortisol, which is known to increase appetite and can boost cravings for salty, sugary, and fatty foods. According to researchers, the response to both types of stress can include “modifying behaviors” such as alcohol consumption, smoking, and eating. It’s also very easy for snacking to become a habit. In a 2015 study by M.S. Tyron, researchers discovered that high-sugar foods can also lessen the stress response. So you can literally be on a sugar high. Over time, the brain may start to rely on these types of foods to calm down. This, in turn, reinforces stress eating in the brain. No wonder so many people have trouble controlling their appetite when stressed. I often wonder if it’s coincidence that stressed is desserts spelled backward. Finding the source of your stress is important. Many people have triggers that lead to certain behaviors. You need to recognize the stress and stressors in your life and identify steps you can take to reduce that stress. Recognizing when you are stress eating means developing an awareness of how you handle your own body’s stress response. Take a moment to tune into how you are feeling, what you are thinking, and how you are acting. If you find that grabbing a high-sugar, -salt, or -fat food is your first response, start to plan how you can interrupt the habit. 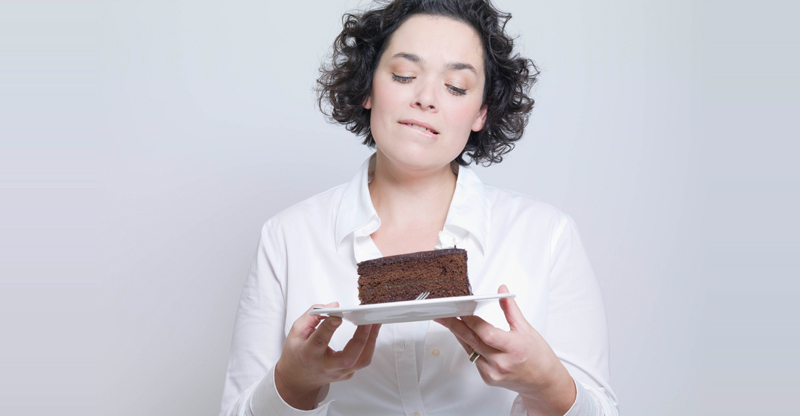 The best way to prevent stress-related eating is to face the stress head on. Easier said than done, right? The best place to start is to find something that brings comfort and is not food. For example, some people find deep breathing, meditation, taking brisk walk, or progressive muscle relaxation to be really helpful quick coping techniques. Having a quick technique handy can help you address the stress without food. If you follow these three steps, you will be well on your way to building new habits that tackle stress without food. Even if you don’t avoid stress eating every time at first, it’s a good start on breaking the cycle. Dallman MF (2010). Stress-induced obesity and the emotional nervous system. Trends in Endocrinology and Metabolism 21: 159–165. Nijs IM, Franken IH and Muris P (2007). The modified trait and state food-cravings questionnaires: Development and validation of a general index of food craving. Appetite 49(1): 38–46. Page KA, Seo D, Belfort-DeAguiar R, et al. (2011). Circulating glucose levels modulate neural control of desire for high-calorie foods in humans. Journal of Clinical Investigation 121(10): 4161–4169. Rogers PJ and Smit HJ (2000). Food craving and food “addiction”: A critical review of the evidence from a biopsychosocial perspective. Pharmacology Biochemistry and Behavior 66(1): 3–14. Sinha R and Jastreboff AM (2013). Stress as a common risk factor for obesity and addiction. Biological Psychiatry 73(9): 827–835. White MA, Whisenhunt BL, Williamson DA, et al. (2002). Development and validation of the food craving inventory. Obesity 10(2): 107–114.